The Residential Curriculum Institute defines a curriculum as having 10 “Essential Elements.” These are the features and principles that a residence life department’s educational program should adhere to if it is to be considered a “true” residential curriculum. In 2013, while in my PhD program, I conducted some research on schools implementing this curricular approach. I wanted to find out more about how the Elements were put into practice and the extent to which schools were successful in fulfilling them. A subset of that research is presented here. This post explores the successes and struggles that schools encounter in enacting each of the 10 Essential Elements of a residential curriculum. To begin, I identified institutions that were regarded as having well-developed residential curricula. To arrive at this sample, I contacted all of the institutions that presented as “Showcase Schools” at past Residential Curriculum Institutes from 2007-2013. Showcase Schools go through a review process and are selected by RCI faculty as exemplars of how to develop and implement a curriculum. Showcase schools were selected for the sample because they are at a more mature place in their development and, as RCI participants, they are familiar with and utilize the 10 Elements. At each of these institutions, I identified and contacted the staff member(s) who were primarily responsible for and most familiar with their department’s curricular efforts. Through the use of an online survey, participants were asked to self report how much progress they believed their department made in achieving each of the 10 Elements. Provided with each Element individually, respondents rated their progress in achieving them on a 1-5 likert scale with 5 representing “Very High Development” (displayed as a blue bar below) and 1 representing “No Development” (displayed as a red bar below). The data revealed a number of interesting patterns and trends. 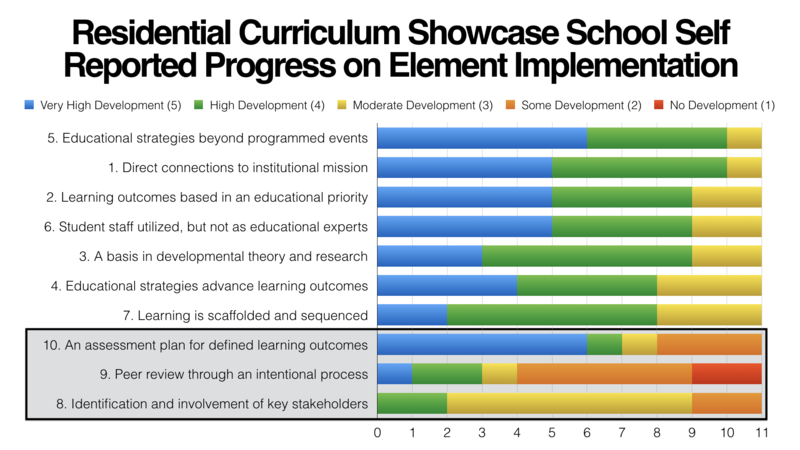 The Elements that respondents reported having the most success in developing are those that relate to developing learning priorities and objectives, aligning the curriculum with institutional missions, theory, and research, and a move away from programmed events as the main method of educational delivery. In the above graph, there is relative consistency in self-reported development across these first seven Elements. This would seem to indicate that these Elements are the most accessible of the ten. The greatest variability in the data collected appeared in the last three Elements (highlighted in the grey box above) which are also the “highest order” Elements of the ten. These Elements relate to (1) the development of an assessment plan, (2) the creation of a peer review process, and (3) the involvement of stakeholders. The creation of an assessment plan is where institutions reported the most progress, although with greater variability than the previous seven elements. Involving stakeholders and developing a peer review process, both of which require buy-in from outside one’s own department, however, demonstrated the most variability and least development. This finding is inline with what most returning RCI participants anecdotally indicate they struggle with the most. The results of this survey reveal a few interesting facts about the Elements themselves as well as how institutions implement them. First, when beginning a residential curriculum, it is important to remember that it is a step-by-step process. An institution will never have it “completely figured out” in their first year. This is normal. Some of the Elements necessarily come before others. Second, a good strategy when deploying the curriculum is to attempt to identify stakeholders and assessment practices from the start. While these may seem unimportant at the outset, doing some preparation may help a department develop their curriculum more fully and quickly. Third, it is natural to have some variation in the achievement of the Elements. All Elements are not created equal and some may be more difficult to achieve than others. Finally, implementing a curriculum is most often a cultural shift for a department and its staff members. It entails learning a new philosophy and approach while breaking with past habits. Curricular development may also be influenced by structural factors at the institution. Although not comprehensive, the following research surfaces some important insights into the curriculum development process. Different departments will struggle and succeed with different Elements at different rates. Much like the student learning curricula aim to promote, the process is messy. With some pre-planning, however, institutions may be able to avoid some of the struggles of and experience the successes achieved by others. What Essential Elements do you struggle with the most? The least? What is the source of your struggles? When starting a curriculum, how can you inform and involve stakeholders from the start? Can assessment be “baked in” to your curriculum as opposed to being viewed as an extra, an add-on, or additional step?